Use entrance on west side of building (behind the Auditorium) with wheelchair accessible ramp. Library on first floor. Portable viewing equipment available for showing library-owned media items for small groups. Scanners located at workstations 2 and 9; those using scanners have priority when other workstations are available. Print and media reserves are located at the NMBCC Library Circulation Desk. Lounges with snack, coffee, and soda vending machines located on the 1st and 2nd floors of the building. Small Group Study Room and multiuse Exhibit Room may be reserved by emailing bcclib@indiana.edu. Collaborative Learning Center room available first-come, first-served for group study. One black & white printer with print release station. 9 workstations, 1 print release station, 2 flatbed scanners. Collaboration table with large screen monitor and capability to connect up to 4 laptops. Welcome to the NMBCC Library! The Neal-Marshall Black Culture Center Library (NMBCCL) serves as a cultural resource for all Indiana University students, faculty, and staff and will be a center of campus cultural activity that highlights Black Culture and the interchange between it and all American culture. Visit us to find out more! The Neal-Marshall Black Culture Center Library (NMBCCL) was founded in 1972. It is a hub of information networking, cultural research, and bibliographic instruction and learning for students, faculty, and staff at Indiana University. The NMBCC Library began as an informal reading room, grew into a distinguished reference and information center on the Bloomington campus, and was organizationally established as a branch library of Indiana University Libraries in 1991-92. 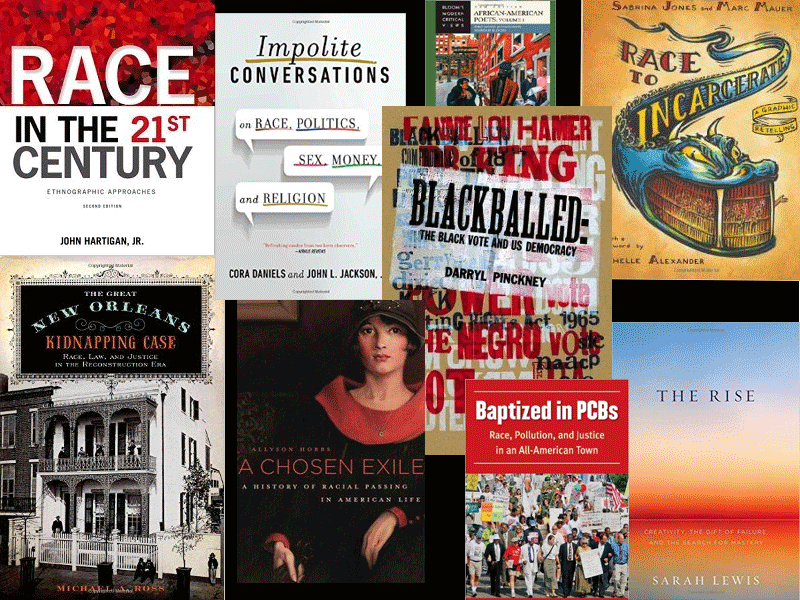 The Neal Marshall Black Culture Center Library Newsletter is generally published three times per academic year, with some special issues. The newsletter highlights upcoming events and programs at the library, new acquisitions to our collection, and other information our patrons will find valuable and interesting. Pick up a print copy of the newsletter at the NMBCC Library or view all our newsletters online. We are located in the Neal-Marshall Black Culture Center, 275 North Jordan Ave. room A113. The Neal-Marshall Black Culture Center Library supports and promotes awareness and understanding of the African American experience, history and culture through library collections, displays, exhibits, facilities, and programs. 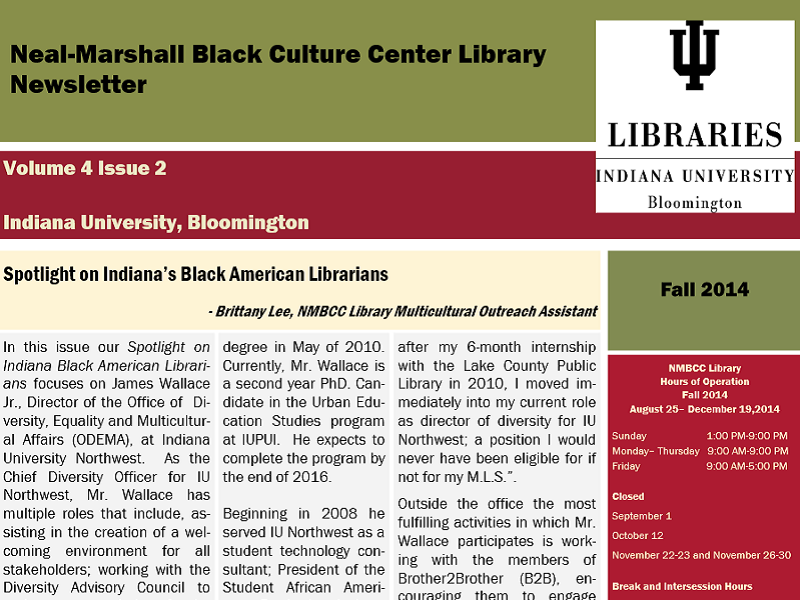 The Neal-Marshall Black Culture Center Library (NMBCCL) serves as a cultural resource for all Indiana University students, faculty, and staff and will be a center of campus cultural activity that highlights Black Culture and the interchange between it and all American culture.